Shefford Town & Campton are within one win of retaining their Premier Division supported by Sportsform crown after netting a 5-1 home victory over Queens Park Crescents. Henry Snee scored all five goals against a lone reply from Crescents Chisom Amadi. Should they win the title, the club have learned they are eligble for promotion to the SSML. Second place Cranfield United’s hopes took a major knock when held to a 1-1 home draw by third place Wootton Blue Cross. Courtney Boughton was on the United scoresheet against a Blue Cross reply via Xenon Paul. 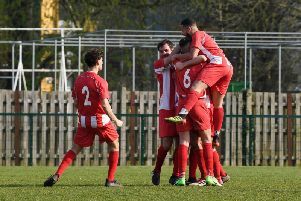 AFC Kempston Town & Bedford College recorded their first home win in seven outings with a 5-3 victory over M&DH Oakley M&DH who last won a game some 10 outings ago. Wes Lewis led the way with a hat-trick to go alongside single strikes from Jonny Richens and Anas Beckhoum against M&DH replies via Zach Ives, Daniel Kelly and Elijah Hukin. Also enjoying life on home soil were Flitwick Town , 4-2 winners over Ickwell & Old Warden. Daniel Stafford, Ritchie Bevan, Andy Dadd and Liam Keane all found the back of the net against a brace in reply from Scott Alleyne. Wilstead took their revenge out for their Beds Senior Trophy final defeat by winning 4-0 at Stevington to record their first away win in nine outings. Luke Pursey with a hat-trick plus a single goal from Shaun Winconek did the damage. Riseley Sports saw their four game winning run ended when held to a 2-2 home draw by Crawley Green Reserves. Lewis Donald and Mitchell Crook were on the home scoresheet againt a Green brace in reply from Reece Green. There is no change at the head of the Division One supported by O’Neills standings following wins for the top three sides. Leaders Bedford Albion won 3-0 at Cople & Bedford SA thanks to goals from Jessie Sidhu, Kegan Roberts and Paul Babbington. Second place Biggleswade FC Reserves are now unbeaten in their last 13 starts after winning 4-1 at home against The 61 FC Luton Reserves. John Veal netted a brace alongside single strikes from Geoge Holman and Harry Roberts. The lone 61 FC reply was struck by George Oawusoyne. For third place Cranfield United Reserves it was a return to winning ways on the road with a 5-0 victory at Wilstead Reserves who have now lost their last six home games. Joe Sames with a brace was joined on the United scoresheet by single goals from Luke Gray, Daniel Cox and Jordan Conway. Swapping fourth and fifth spots are Shefford Town & Campton Reserves with Wixams after the Town took their unbeaten ways up to six games with a 7-1 home win. George McGonagle led the way with a hat-trick, Ryan Dobson netting twice alongside single goals for Kyle Humphries and Adam Larsen, the lone Wixams reply coming from Gareth White. In sixth place are Totternhoe Reserves who won 2-1 at Christians in Sport (Luton) with goals from Archie Taylor and Pearce Tracey against a home reply via Peter Wilson. Seventh place Henlow ran out 3-1 away winners at AFC Kempston Town & Bedford College Reserves. Luke Hills netted all three goals against a lone Town reply from Emmanuel Akaka. Sandy have now lost their last six home encounters after being beat 4-2 by Lea Sports PSG. George Nivan, Warren Bell, Sean Dixon and Will Tyler on the PSG scoresheet against home replies via Jonnie Stratford and Jamie Stock. The leadership of the Division Two supported by Hy-Pro league table is now back in the hands of Houghton Athletic after they sent morning leaders Elstow Abbey to their first league defeat. Jordan Thomas, Felix Sackey and Oilver Swaby were on the Athletic scoresheet in a 3-1 win against a lone Abbey reply from Tom Watts. The Abbey still remain firm favourites for the title being just goal difference behind and having played two games less. In third spot are Atletico Europa who won 5-2 at CS Rovers who thus ended their six game unbeaten home run. Abuki Sulyman with a hat-trick and Paddy Alimanji with a brace brought up the nap hand against Rovers replies via Connor Hasson and Shane Robb. Also enjoying life on the road were Sundon Park Rovers who made it four away wins on the bounce with a 2-0 victory at M&DH Clapham Sports. Ben Pincher and Rayvaun Bridgette netting the Rovers goals. For Marston Shelton Rovers Reserves, following seven straight defeats it was a return to winning ways with a 4-3 home win over Unite Mk Reserves. Lorenzo Jordan with a brace plus an own goal and a strike from Carl Borromeo marked the Rovers scoresheet against visitors replies via Prince Mukolonga, Brenden McConnell and Mustafa Nas. St Joseph (Saturday) took their winning home ways up to four games with a 3-2 victory over Clifton. Kieran Carey, Rian McDonald and Joe O’Reagan on the Joe’s scoresheet against a brace in reply from Jose Carles. Now unbeaten in their last eight starts are Sporting Lewsey Park who were the 3-0 home winners over Caldecote Reserves. Luke Lincoln seeing his first half brace added to by a succesful penalty from Chris Gibson in the second half. Luton Leagrave AFC and Kempton Athletic shared the spoils from a 2-2 draw. Ryan Hill and Nico Covileac netted for the home side against Athletic replies from an own goal plus Daniel Mattin. AFC Oakley M&DH Reserves were gifted the three points when Black Swan (Luton) failed to raise a side to make the journey to North Bedfordshire. In the limited Division Three supported by Hy-Pro action Thurleigh maintained their push for promotion with a 4-1 home victory over Wixams Wanderers. Kevin Harris netted twice to go alongside single goals for Bradley Raines and Ross McMullen against a lone Wanderers reply from Joe Homes. Also hitting four goals at home were FC Polonia who beat Dinamo Flitwick 4-2. Pawel Seliga with a brace was joined on the scoresheet by single goals from Andrew Martin and Przemek Gorezyca against a brace in reply from Scott Hannam. Following five straight defeats Square FC returned to winning ways to net a 2-0 home win over Real Haynes Reserves thanks to goals from Tamis Kamara and Josh Moffatt. Whilst a lone goal from Tom Bates was enough to give Flitwick Town A a 1-0 home victory over Shefford Town & Campton A. This season’s Watson Shield Final will be between Harlington Juniors and Pines (Luton) after they both emerged penalty shoot-out winners on the road. The Pines won 5-4 on spot kicks at Real Haynes after 90 minutes play had saw the sides deadlocked at 3-3. Jordan Webber, Bill Flack and Tyler Winter on the home scoresheet against Pines goals from Ryan Smith twice and Craig McCann once. Whilst Harlington won their shoot out 3-2 after 90 minutes play at Stevington Reserves had brought about a 1-1 scoreline. Regan Scott on the home scoresheet and Darren Bryan replying for the visitors.